BROWARD COUNTY BUSINESS & PROFESSIONAL WOMEN’S NETWORK—Broward County Business and Professional Women’s Network held its Ninth Annual Founder’s Day and Scholarship Luncheon on May 5, 2013 at Signature Grand, Davie Florida. Theme: Moving Forward with a Purpose. 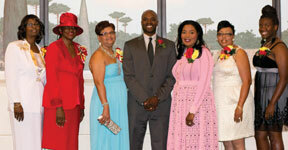 Honorees: L to r: Lana Hand –Religion; Elaine Lenon – Community Service; Irene Thompson-Roper – Education; Dr. Fidel Goldson, Jr., – Man of Distinction; Vice Mayor, Barbara Sharief – Professional Award; Rev. Rhonda Thomas – Education and Scholarship Awardee: Ashley Cromartie.